Foucault's claim that language is power is a much-discussed issue. But single words can also have a socio-political impact. Words can launch new phenomena, bring to light previously neglected identities, and change the emotional and moral values associated with established facts. Many of the words we use on a daily basis today do not have a long history in our languages; nor have they arisen organically in our collective vocabulary. Instead, they are the result of effective lobbying campaigns. This is a trend that has increased in recent decades. In the US, the Republican Party and neoconservatives have been particularly successful in using specific words and phrases in a systematic way with the aim of evoking strong emotional responses. The master of political word spinning is the political consultant Frank Luntz, who was hired by the Republican Party to craft messages that convey positive impressions of the party's policies. One example is how Frank Luntz advised the Bush administration to abandon the internationally established term "global warming" since it circumvents negative connotations, and instead use a new and less alarmin sounding term which Luntz and his team had invented: "climate change." Sweden has a long tradition of inventing new words for political purposes. A recent example is "livspusslet" ("the life puzzle"), a word used to describe the difficulties of combining a career with a satisfactory family life. This word, which is frequently used in political discourse as well as in the mainstream media, was not only created by the Swedish special interest group, TCO (The Swedish Confederation for Professional Employees), but has also been registered as trademark by them. To trademark register a specific word which is connected to brand of a product, company or a commercial services, has been done since the first comprehensive trademark system in the world was passed into law in France in 1857. But since the last decades, political organizations and special interests groups have also started to trademark register words and phrases connected to their political ideas. The Swedish christian conservative party KD trademark registered, for example, the words "the people of reality" ("verklighetens folk") which they launched as a term for what they considered a majority which opposed the values of the left-wing cultural elite. The Social Democrats, have later trademark registered "the nordic modell" as the welfare concept common to the Nordic countries (Denmark, Finland, Norway, Iceland and Sweden), which includes a combination of free market capitalism with a comprehensive welfare state and collective bargaining at the national level. Another rather recent development of the politics of language is the introduction of euphemisms into language in the hope of eradicating unwanted associations of class, gender or ethnicity. For example, the center and right-wing parties have promoted tax deductions for "hushållsnära tjänster" (household close services) - a term that sounds relatively neutral and doesn't evoke the same stigmatized images of class and gender as words like "maid" or "cleaner" do. Especially when it comes to labeling identity, words can have tremendous social and political impact on how one social group thinks about another. In the past decade, there has been a discussion in Sweden about how to refer to people who have immigrated to the country. "Immigrant" was used for a long time in official contexts. Other terms, like "second generation immigrant" and even "third generation immigrant" have also been used; often for people who have been born in Sweden and lived their entire lives here. Recent media studies show, however, that the word "immigrant" is most often used in connection with societal problems, such as drugs, criminality and social exclusion. In an attempt to avoid the stigmas associated with the word "immigrant," governmental authorities have introduced a whole range of alternatives, such as "nya svenskar" ("new Swedes"), "utrikesfödda personer" ("foreign-born persons") and ("persons with foreign background"). Brune, Ylva, "Invandrare' i mediearkivets typgalleri", Maktens (o)lika förklädnader, (ed.) de los Reyes, Stockholm 2002, p. 150-181. Presentation of the project at Gallery Andrehn-Shiptjenko, Stockholm, 2007.
the developments described above. The project can be described as a socio-political experiment where a new word has been invented, trademark registered and then been disseminated into the population to make its way into the Swedish language. 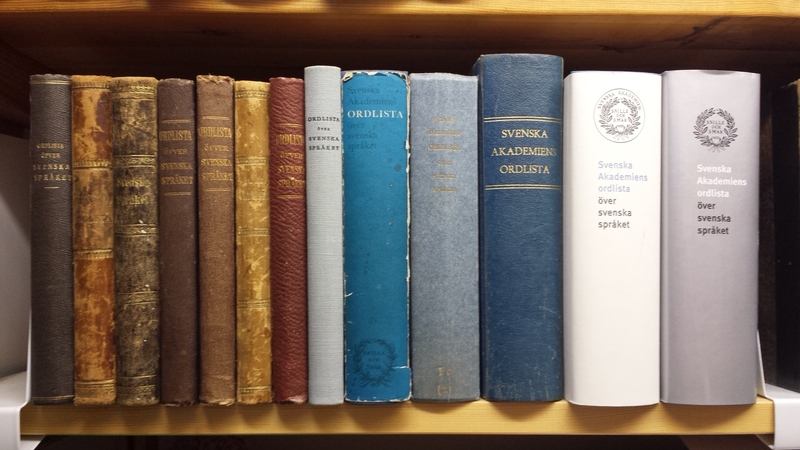 The goal of the project is that the new word will be included in the next edition of The Swedish Academy Dictionary (Svenska Akademiens ordlista) as an evidence of the establishment of the new word . After this objective has been accomplished, the trademark registered word will be auctioned to the highest bidder who will then be the owner and consequently also the controller of the use of the word. 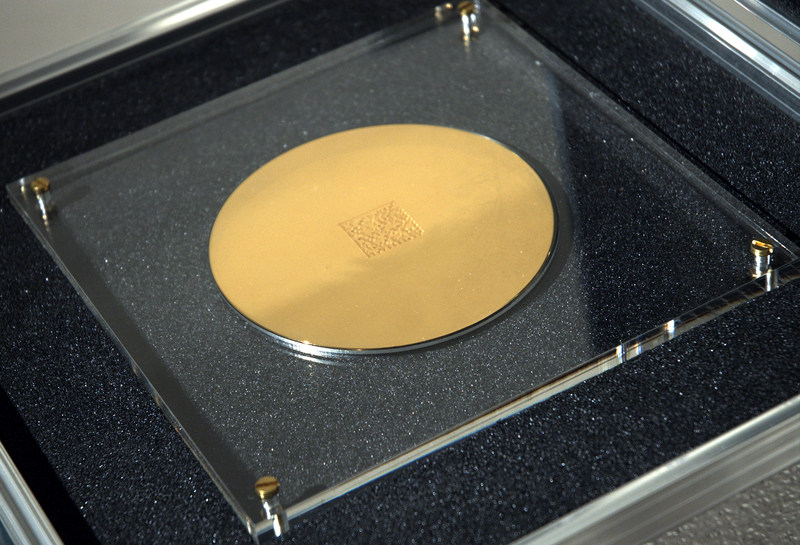 The invented word as an encrypted 2D Data Matrix code, etched into a 24 carat gold plated copper disc, and displayed between two sheets of plexiglass in a fireproof padded aluminum case. The invented word is documented in the form of an encrypted 2D Data Matrix code, etched into a 24 carat gold plated copper disc, which is a combination of two techniques for safely storing information that has been used by NASA: Engraved 2D Data Matrix code on parts of space rockets, and etched gold plated copper disc, which NASA used for the Voyager Gold Record that was attached to the Voyager 1 spacecraft launched in 1977 and which was meant to serve as a kind a message from mankind. Cover of the Voyager Golden Record with engravings onto the gold plated copper disc. 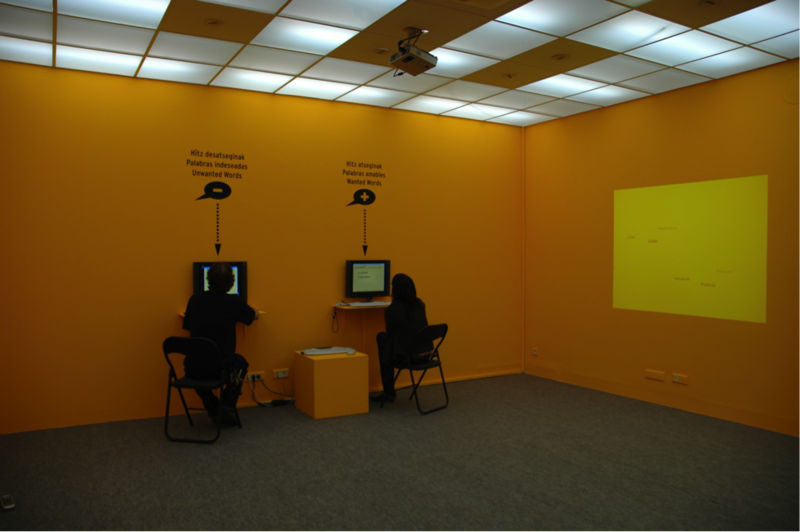 The Spin Word Project is a development of The Revolutionary Word Project and was conducted in the bilingual Basque Country in Northern Spain, and presented at Montehermoso Cultural Centre in Vitoria-Gasteiz in 2008. The project takes its starting point in the rhetorical strategy, in linguistic called “compounding”, when a new word is formed by joining two existing words with different meanings. This strategy is widely used by political spin-doctors and PR-consultants for changing the emotional and moral values attached to established facts, as well as to launch new political ideas and reforms. In the first part of the project, an online survey is conducted to collect and determine the “most unwanted words” in the region in both Spanish and Basque— that is, words that have negative associations because they are socially stigmatizing or have been politically abused. 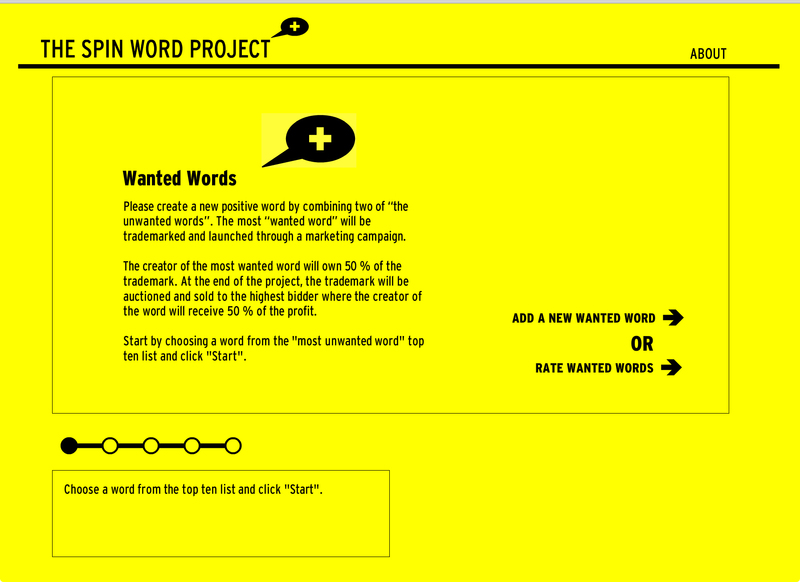 A three-minute video which presents The Spin Word Project. In the second part of the project, new words with positive associations are created. This is done by using one of the most common techniques for creating new words — in linguistics called “compounding” — that is, when a new word is formed by joining two existing words with different meanings. English version of the online survey. The online survey in Basque (Euskara). 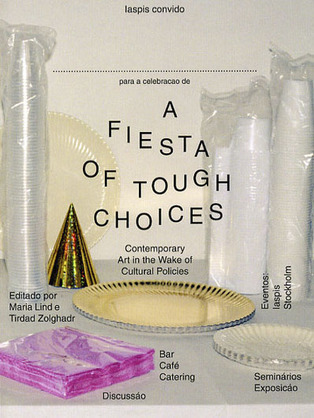 The project is included in A Fiesta of Tough Choices: Contemporary Art in the Wake of Cultural Policies Eds. Maria Lind and Tirdad Zolghadr. Contributors: Timothy Brennan, Loulou Cherinet, Peter Geschwind, Jonathan Harris, Edda Manga, Philippe Parreno, Kate Rich, Natascha Sadr Haghighian, Hito Steyerl, Måns Wrange and Tirdad Zolghadr.